Sometimes life can be busy and overwhelming. As a result our houses get messy with stuff here, there and everywhere. It happens. But knowing where to start with the organizing when life gets this way is also overwhelming. So every once and awhile I like to offer you a quick tidy task to do. Something that can be done in about 10 to 15 minutes. Today’s task is to declutter magazines in our home. 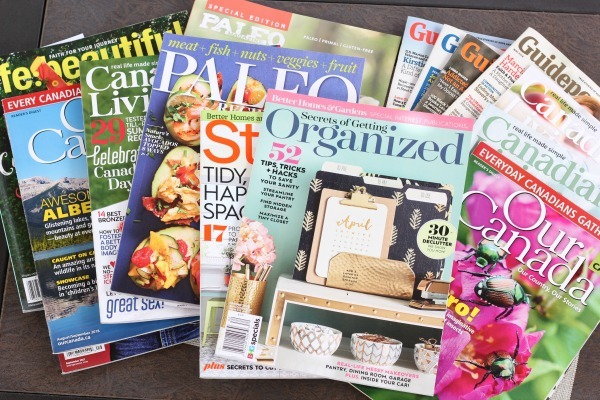 I recently had to declutter magazines in my own home and that’s what sparked this post. I love magazines because they can easily be read in short bursts and aren’t too mind challenging 🙂 I especially love Canadian magazines because I can see what new products are out there. I may be the only person that gets excited about the advertisements, ha! I LOVE trying new products! Is that weird? The first task was to take a walk around my house and gather all my magazines up into one spot. I had little stashes everywhere. Some in the living room, some in the dining room and more beside my bed. 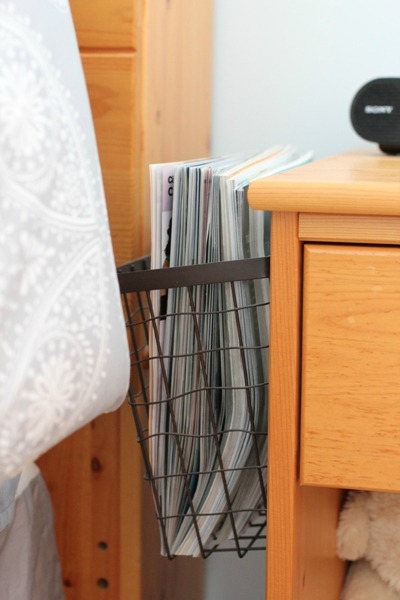 I have a great bin on the side of my bedside table (attached with Command Hooks) that I store magazines in. Very convenient. I had no idea how many I actually had until I saw them all together like this. That’s why the consolidation step is so important! Once you have your stack of magazines in one spot, do a very fast purge of the ones you know you can part with immediately. Maybe you’re already done reading it, maybe it doesn’t interest you anymore, whatever the case go through and sort those ones out. Pass them on to a friend, donate to your local thrift store or simply recycle them. Often we keep magazines kicking around because there’s an article we want to read or a recipe we want to try. Or in my case a product I want to try. Here’s what I do. If it’s a recipe I want to try, I rip the page out and file it. 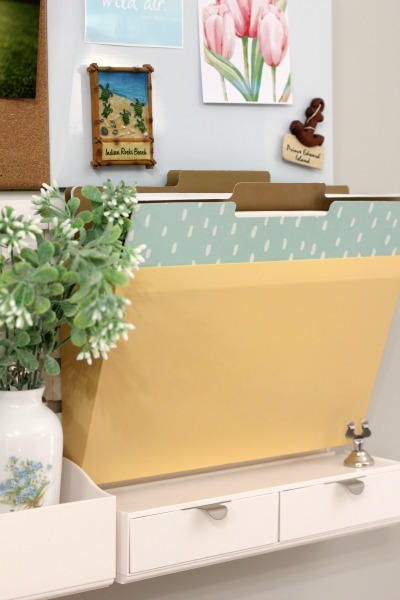 I have a file system I use for recipes to try in my kitchen. Although now that I eat Paleo very few recipes I use come from regular magazines anymore. Instead I love dedicated Paleo cookbook magazines and those I keep. For everything else I take a picture of whatever it is I’m interested in and add it to an album on my phone called “Products to Buy”. Then I can easily reference it when I’m out shopping. It works really well for me. This could also work well for recipes or crafts. Phone photo albums are a great way to organize information. I know others that use the Evernote App to collect data they want to reference again. 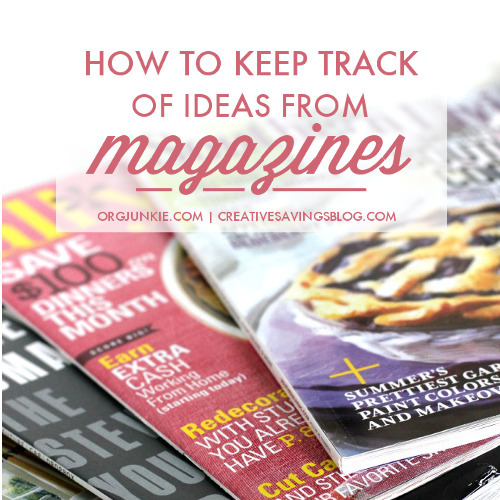 That’s what my former contributor, Kalyn, explains she does in her post: How to Keep Track of Ideas from Magazines. Obviously this step may take longer for some if there is a ton of information you want to keep. First consider though whether or not it would be easy enough to obtain the information from the internet if you needed to. Second guess yourself whether or not you really need it in the first place. Once you’ve taken care of the information you want to reference at a later time, it’s time to do a second purge. All that should be left are the magazines you are still interested in reading. If there are still quite a few remaining, a few limits may be necessary. 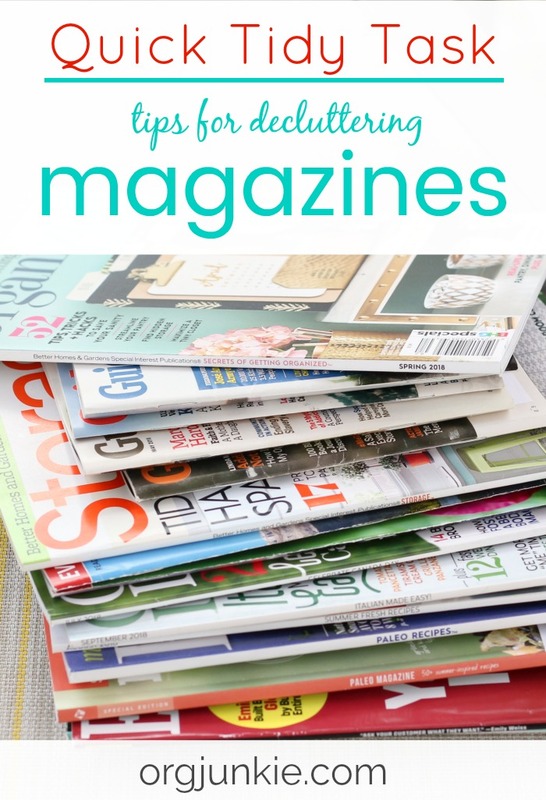 There are a few ways to keep on top of the magazines in your home. One way is to keep a magazine number limit. For instance, you might give yourself a limit of 10. This way you have an imposed boundary so you know if an eleventh one comes in, you’ll have to part with one in order to keep it. Or it might be easier to have a bin boundary so then once the bin is full, it’s a visual reminder to you that it’s time to purge. 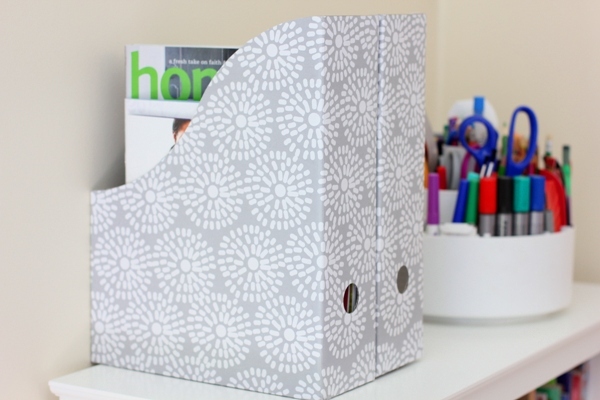 These cardboard magazine files from the dollar store are perfect for this. Another way to manage magazines is to impose a time limit. For instance, only keep magazines that are less than 4 months old. Imposing limits is an excellent way to stay on top of and declutter magazines as needed and regularly. So how many of you need to declutter magazines? I not only hope these tips are helpful but that this post serves as motivation to get it done. Many quick tidy tasks over many days will lead to less stuff in your home. Homes with less stuff are also homes with less chaos. And I don’t know anyone who wouldn’t want a little less of that! 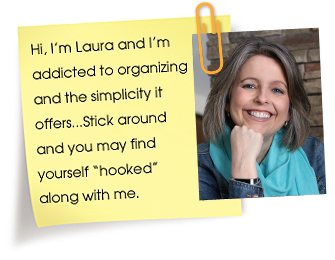 For my FREE 100 Organizing Tasks to Tackle Printable please subscribe HERE! Did you know that most libraries have e-resources included with your membership? I use RB Digital through my library. That way the physical magazine never enters my house. I can still screen shot ideas to save but I never have to deal with the physical clutter in my house. And the best part – it’s free! I put some articles in a big binder for reference. I may use a plastic cover, if I will keep it. I used to be overwhelmed with magazines. Then I started using Texture app. ($15 per month for unlimited magazines and also back issues). If you don’t mind digital this is a HUGE help.